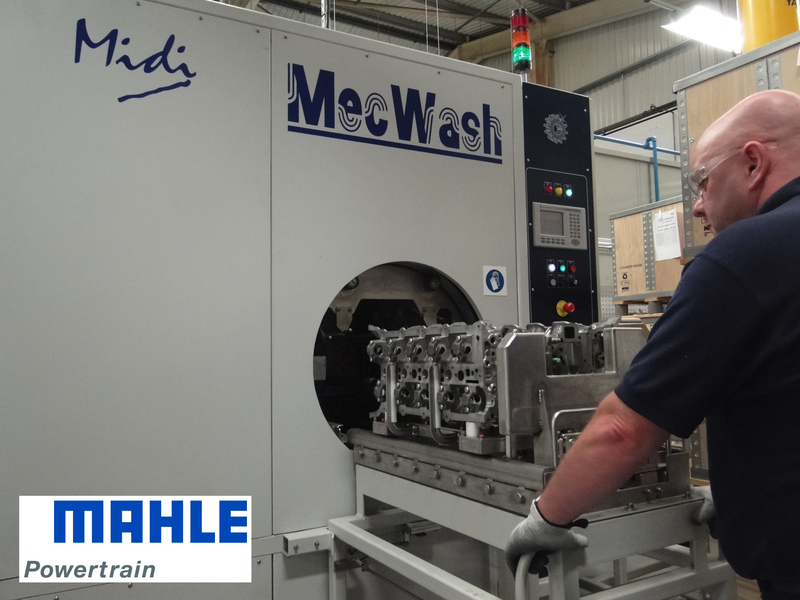 “Each set, which comprises two cylinder heads and a block, features a wide range of machined elements, all of which have to be cleaned of machining oil and metal swarf to meet the customer’s specifications,” explains Phil Knightley, Production Engineer at MAHLE Powertrain. “Clearly, this places great emphasis on the capability of the cleaning station, which fulfils a vital role between machining and both leak and porosity testing procedures, ahead of packing and despatch. do so in an environmentally responsible way as a result of the aqueous-based design,” he adds. MAHLE Powertrain operates an Environmental Management System in accordance with the international management standard, ISO 14001.
programme and one that pays testimony to the co-operation between the designers at both MAHLE Powertrain and MecWash Systems. Because all machine designs from MecWash Systems incorporate aqueous-based cleaning solutions, environmental issues that are associated with alternatives such as solvents, become irrelevant. Moreover, due to the filtration system, the wash solution is re-used repeatedly, with MAHLE Powertrain anticipating a changeover and disposal on a three-monthly basis only. “We assessed a number of alternative systems during the specification phase, but concluded that the MecWash design optimised both our performance and environmental objectives – particularly given the high quality and high profile application within which the unit operates,” adds Phil Knightley. “Moreover, the company’s ability to supply the machine, the fixtures, the trolleys and the chemical, meant there was an automatic interface between each of these key elements. our capability in both areas, and help enable us to meet future high volume output for one of the most prestigious automotive manufacturers in the industry,” he concludes.